The Blue Box is a basic cubic structure which invites visitors to enter the structure as a playground and meeting place. It is a geometrical representation of the dimensions of height, breadth and width. In addition to this it is a surface and stage for the projection of movement and thus the subjective experience of time, the 4th dimension. 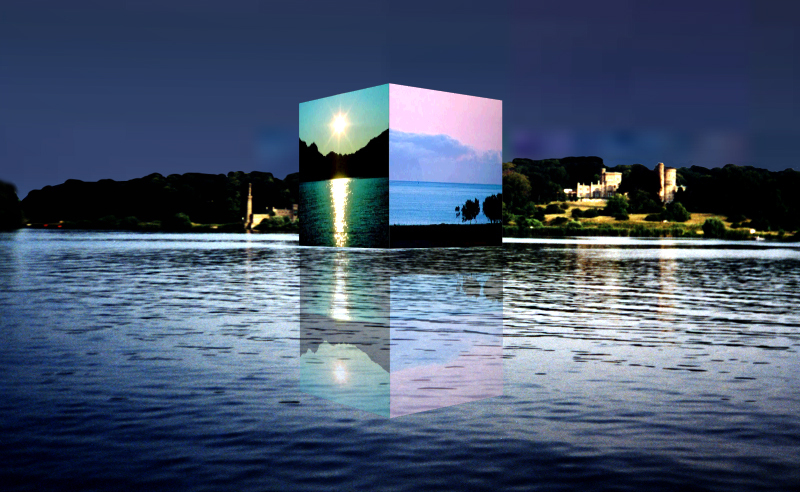 Blue Box is an artificially created world representing portal between the real and virtual realms. The project will travel across the world moving from site to site at 1 to 2 year intervals. The ground floor, an area of 900 m², does not just present ample space for sound, light and projection equipment. It simultaneously provides a presentation space for its sponsors. Blue Box presents the digital age with a venue that meets its most innovativedemands. Blue Box is an accessible computer for everyone, a terminal for International Art. Demountable – A travelling contruction wandering across the world, relocating every 1-2 years. Easy to transport, easily assembled, for many varying uses, changeable, extendable, adaptable to the most varying of climates, demountable, portable. Construction – Steel rods are connected using quick-to-fit Sigma joints to form 3x3x3m cubic frames. These cubes represent the basic building blocks of the construction. These building blocks can be used to build a host of larger cubic structures. The cubes are made rigid by the use of diagonal and transverse struts making the spanning of large distances possible. “Landscape” – A Space within a Space. Using four powerful projectors the outer walls of the Blue Box will be covered with images of our lanscapes via internet and photos of various artists from different countries. The concept Landscape as a concept of space will be confronted with a mirror image of itself as a representation of space. The structure will be presented in the Internet via live webcam transmission. By use of the internet the work of art will be visible and accessible to the public and artists from every corner of the earth and will thus allow an interactive participation of its artists, thus making the project mutable.